You don’t have to cook a chicken especially for this recipe, writes Lotte Duncan. I often use the leftover chicken from a Sunday roast for this pie on a Monday. To cook the chicken, place it in a large saucepan and cover it with cold water (about 1.7 litres/3 pints) and add the carrot, onion, celery, herbs and peppercorns. Bring to the boil, and simmer for 1½ hours or until the meat is falling off the bones. AGA 4/3/2 door Place in the simmering oven. Set the cooked chicken aside until it is cool enough to handle. Remove all the meat from the chicken, put the leftover bones back into the stock and then simmer for another 30 minutes. Strain the stock through a sieve into a clean pan and discard the bones and vegetables. Preheat the oven to 200°C/fan oven 180°C/gas mark 6. AGA 4/3/2-door Grid shelf on floor of roasting oven. 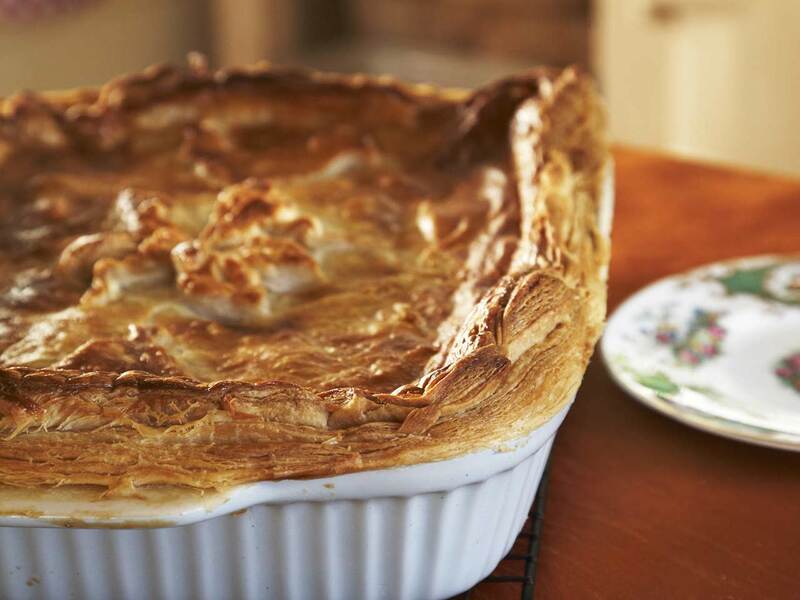 Cut the chicken meat into bite-size pieces and place it in a 2.3 litre/4 pint pie dish. Reduce the chicken stock in the pan over a high heat until you have 850ml/1½ pints in volume. Melt the butter in a large, non-stick frying pan or saucepan and fry the leek and peppers for 5 minutes over a gentle heat. Add the mushrooms, diced squash and thyme and cook for a couple of minutes. Blend the flour into the vegetables and slowly add the reduced stock, stirring all the time. When it has thickened, simmer for 2 minutes; add the mustards and season with salt and pepper. Spoon over the chicken, stir well and allow to cool down. Now, dust a worksurface with flour and roll out the pastry to the right size and shape to top the dish. Cut a long, thin strip of pastry long enough to go around the rim of the dish. Dampen the edges of the dish and place the strip around the edge. Cover the pie with the pastry and decorate with any cut-off pieces. Knock up the edges of the pastry, crimp and glaze with the beaten egg. Place the pie on a baking sheet and cook in the oven 30 minutes. Reduce the oven temperature to 160°C/fan oven 140°C/gas mark 3 and cook for a further 30 minutes. AGA 4/3-door Grid shelf on floor of baking oven. AGA 2-door Grid shelf on floor of roasting oven with cold plain shelf of third runners. If it gets too brown, loosely cover with a little foil to protect the pastry. When choosing a butternut squash, pick one with a fat neck and a smaller rounded bottom. This is because most of the flesh is in the neck and the seeds are in the rounded bit. If you buy one with a large bottom (!) it will be mainly seeds. Lotte's Country Kitchen by Lotte Duncan with photographs by Lara Holmes is published by Absolute Press priced £20. Buy this book from the Saga Bookshop.